If you're looking to learn the history of England in a concise book, I'll warn you that this is not the one you want. But its misleading title is probably its worst aspect. Rather than being a history of England, this book is *about* the history of England. It's a commentary, and it may be a good one. But if you don't know the backstory, then the commentary can be frustrating. There are a lot of statements of this general form: "What happened next was not only [this], but it was actually [that]." Well, great. But what was it that actually happened next? It doesn't say, but goes on to discuss the implications. There are many references to people and events that are deep in the backstory. 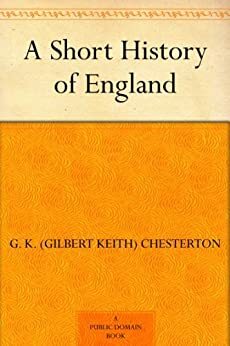 All that said, I think the book provides some interesting views on English history, but you'll be at a disadvantage if you don't know the history all that well. I had forgotten that this work existed, and am delighted to have found it. Written during World War I, it is in a small sense a work of its time, and in that a fascinating glimpse of one man's perspective of that tragic period and its origins. But it is far more than that: a provocative, unique and even mind-bending review of the forces of history that Marx could not possibly have understood. I found myself forced to think, ponder and muse on every page. And for a work that is a hundred years old it is oddly enough as fresh as the morning headlines. I haven't read this book yet, so am just reviewing the format. Notice the dimensions: 8.5 x 0.2 x 11 inches; the books is irregularly tall and wide, but thin and floppy. The first several pages are a poor photo copy of some printed version of the book. The majority of the text seems to have been copied and pasted from a different-sized book without being reformatted, so that the content that would normally show up in the heading of each page -- the page number, chapter title, and book title in caps -- shows up, in this printed version, not as a heading, but on a random place on each page; this means that the "page numbers" reflect the number of the original book, and are inaccurate and worthless for this version. Similarly, occasional formatting notes -- things like "H3," "6*", and others -- appear at random parts on the page, interrupting sentences. Lastly, the cover picture is terribly grainy, not nearly as clear as the picture on Amazon suggests. I would return this, if it were not such a hassle. Buy a different format, unless you just plan to read once and toss it out. If you love Chesterton, this work is full of the kind of cutting humor and cultural insight that is his best. The title is a bit misleading in the sense that this is more a "collection of essays on aspects of English History." It should also be seen as a critique of other popular histories of his day. However, he remains the best Christian apologist in the modern era and of the modern era.